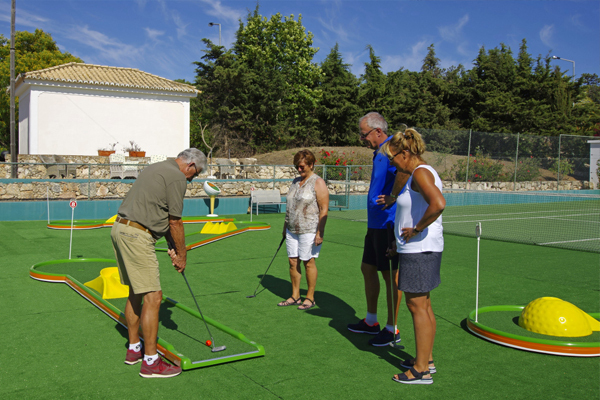 Quinta do Rosal has available a new mini golf course with 9 holes. The mini golf is for all ages and for families to have a good time. Discover who is the best player. Why not get outside and take advantage of the glorious Algarve sunshine on one of the two Quinta do Rosal premium tennis courts? All equipment is available to borrow and you can book a court at the site reception. Many agree that the Algarve is the number one destination for golf. Whether you are a keen golfer, or have never picked up a club before but fancy giving it a go, you'll find your ideal course. Algarve landscape lends itself perfectly to golf courses – there are wide open spaces and the scenery is spectacular. For this reason there is a fantastic choice of courses, some difficult, some simple but all surrounded by beautiful sunny scenery. The Algarve is famous for its beaches... Incredible ocean views, soft golden sand, stunning cliffs and warm waters mean that you really can't go wrong. Quinta do Rosal is lucky enough to be situated close to a great many of them and visitors to the resort can take advantage of their proximity and the consistently good weather along the coast. If you need to top up on essentials, the reception at Quinta do Rosal sells milk, tea, drinks etc and you can pre-order bread the day before. There are three big supermarkets all roughly 3 km away, located between Lagoa and Carvoeiro, and these are: Aldi, Apolonia and Intermarché. The city of Albufeira has a long and interesting history that is thought to stem back certainly as far as Roman settlements, and possibly even before that. Its excellent position on the coast has meant that the fishing industry played a large part in its culture, with the export of fish and nuts being very important in the 20th century. Tourism really boomed here in the 1960s and now there is a whole host of things to see and do. Carvoeiro is a large town on the south coast. What started out as a small fishing village has grown and grown into a major tourist destination, thanks in part to a great selection of sandy beaches that are protected by towering cliffs. Tourism is now booming with guests coming to take advantage of the beautiful coastline, the water sports and a good selection of bars, cafés and restaurants. Lagos has always had a seafaring connection, originally visited by Phoenicians and Carthaginians and then, during the 15th century, the town is certainly full of history, but it is also a vibrant town with lots going on, take advantage of the beautiful coastline, the water sports and a good selection of bars, cafés and restaurants. With its long sandy beaches and wealth of culture to discover, as well as its quick and easy connections to other fascinating locations in Portugal, Quarteira has definitely become a top holiday destination. With incredible sunshine and an beautiful coastline, you are sure to be in the mood for a splash around in the water during your stay in the Algarve. If you fancy something a little different from the Atlantic, why not try out one of the local water parks? They're fun for all ages and provide a great way to spend the day. Don't be put off in the winter months! Thanks to the Algarve's southerly location and enviable climate winter at Quinta do Rosal is still incredibly mild with temperatures usually between 16° C - 19° C. Escape to Portugal for the winter and enjoy a relaxing holiday somewhere special. Food lovers will be delighted if visiting the Algarve; the region is known for its culinary delights, whether it is fresh sea food, traditional Portuguese cuisine or international fare. If you’re seeking the sunshine and some great food, you’ll be sure to find something tasty at any time of year. Few things factor into someone’s ultimate appreciation of a holiday in the Algarve quite as much as the weather. Your plans could ultimately change significantly if the weather has not been properly accounted for; your sunbathing plans could be scuppered if the temperature drops, while sightseeing could be interrupted by the incursion of rain. While certainly an unlikely prospect; considering that the Algarve region is exposed to an average 300 days of sunshine, it can never hurt to prepare for the worst, even if it never actually occurs.